Here is the UKRAINE MISSIONS June 2017 Newsletter! There were many awesome events in June but we could not write of all. Perhaps the most amazing blessing was toward the end of the month when our Ivano-Frankivsk brothers and sisters cleaned up the constructed assembly room and the FIRST worshipping assembly was held! A special report is posted on the web site regarding this and if you have not read it please do so. In this report there is a brief mention and a sidebar photo of the cleanup the day before the historic assembly. In June a number of other events took place in Ivano-Frankivsk. 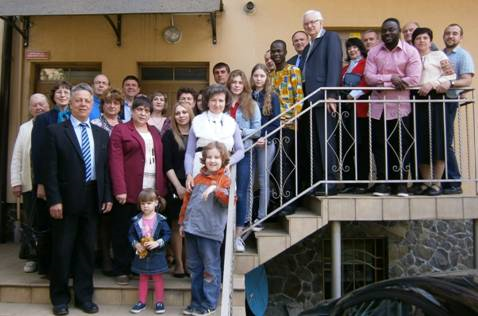 Brother Mike Lawson coordinated the youth camps in Stary Lysets and Ivano-Frankivsk, Bill & Luba Wharton conducted a marriage strengthening seminar, Pat McIntosh came and taught in the Bible Institute, the new church plant in Yarmanche further developed (see Andrew's report). An amazing amount of actions peppered the month. June 9, 2017 John Kachelman Jr. Attached is the May 2017 UKRAINE MISSIONS Newsletter. As I was compiling the newsletter I was impressed with the amazing work that the Lord is doing in Ukraine. "We love you and thank God for our spiritual family. In Christ, Ivan and Svitlana"
"Thank you for our unity and fellowship in Christ, your support and prayers. May God bless you. We always keep you in our prayers. With love, Your brother in Christ Volodya"
"I ask the Lord to bless you in everything you do, to keep you healthy and to build you up spiritually. I pray for you continually and wish good health, God's love and blessings for you and your families. With love, your brother Pavel"
"I thank all who read my reports, pray for my ministry and my trips. You are in my heart and prayers. In His service, Andrew"
I would like to mention again the great need Dr Gary Jerkins highlights in this month's report for medical professional caregivers to be involved in the planned medical seminar in Ivano-Frankivsk. Read about this seminar and help us contact those medical professionals that might be interested in going to Ivano-Frankivsk to help the presentations in the seminar! Starting Wednesday 14 June I begin teaching the Auditorium class at the College church of Christ. The topic is "ACCEPTING THE ANGER OF GOD." This will focus on lessons gleaned for my most recent book. If you are in the Searcy areas on Wednesday nights please join us in this intriguing study of a topic that has been erased by modern culture. On Sunday 18 June I will be speaking at the Tyner congregation in Chattanooga, TN. At the worship assembly I will preach a gospel sermon and at the Bible Class period I will be reporting on our mission efforts. If you are in the area please join us. Thank you for your support and encouragement in the Lord's Work! Read this entire post online at http://www.kachelman.com/ukraine/blog/2017/06/09/may-2017-ukraine-missions-newsletter/. Construction will continue on the main assembly room but first they need to begin work on the access road that will legally allow the use of the property for assembling large numbers for worship and classes, receiving shipments and the traffic required for the distribution of benevolent items. Much has been accomplished and more still lies ahead but what a wonderful event is marked in the history of the Ivano-Frankivsk church of Christ on Sunday 02 July 2017! I have received the financial accounting for the construction costs for the first section and will make that available to you in the above as well (We had to have them translated by a professional group as terms and phrases specific to architecture and construction were used and I did not want to torture Tanya by asking her to translate. As you look over the construction costs for the first building please remember that the contractor (Andrew) donated "gift in kind" $30,000+ at the beginning when we needed to get approvals, documents, etc. for the construction to be approved by the Ivano-Frankivsk governing board. This was necessary to get the approval for the building. This donation does not show anywhere as Andrew did not want a record. When we added the warehouse we paid for these items. I cannot but give BIG thanks to all those that encouraged us, supported us, told us off at times, motivated and donated their funds, time and prayer to this work!!! THANK YOU A MILLION TIMES!!! May God bless you hundredfold and more!